Richard Sherman Calls Darrelle Revis "Irrelevant"
Every morning, the fine folks at Sports Radio Interviews sift through the a.m. drive-time chatter to bring you the best interviews with coaches, players, and personalities across the sports landscape. Today: Sherman's still steamed over that Twitter fight. Richard Sherman joined 710 ESPN in Seattle with Afternoons with the Go To Guy to discuss Darrelle Revis possibly winding up in San Francisco, his trash talking on the field, offseason moves coming up for Seattle, his favorite memory from this past season and the play of quarterback Russell Wilson. 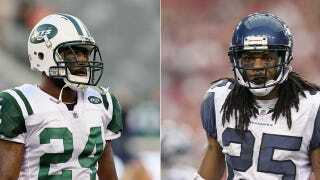 How would you feel if Darrelle Revis ends up with San Francisco? "It'd be fun either way. There's always a rivalry there. I still wouldn't get to play against him directly, so it really wouldn't matter to me. I'm sure our receivers would have a little fun with him. I don't mind either way. He's really irrelevant in my mind." "I mean, it's a little bit of both, you just kind of want to win the game. Whatever it takes to win the game is kind of my mindset. You go in there and if it's getting them guys in their head … I'm just trying to win the game, whatever it takes." Do you ever worry that a receiver is going to line up against you and decide he wants to shut you up once and for all? Do you concern yourself with what the Seahawks need to do in the offseason in terms of personnel? "No, not really, because nobody out there knows but our front office what is really going to happen. So all of that is just going to change. … There's no reason to read any of that. If I want to know any of that, I'll just call our people." Does management ever consult you about what you think they should do in free agency or the draft? "No, he doesn't consult me. Shoot, they've been doing a great job the past couple years. I wasn't a part of it then, so I trust them. We trust everything they do and have tremendous faith in their ability to help the team and improve us in any way they can." What was your favorite memory from the 2012 season? "I guess the run we made at the end. The last couple games we were on a nice run, had a nice streak. Everybody seemed to have found their confidence and rhythm. It was a good time in the locker room." "Well, I mean, we kind of had already had believed. Around that time, he'd already beaten the Packers, Patriots, Cowboys. He had already proven himself in our eyes. Great play merits respect. You have to respect the guy. The way he works, the way he studies, the way he prepares, the way he plays, he attained our respect." What all-time great wide receiver would you most like to match up with in a game? "I guess Jerry Rice. It'd be fun. … He's a crafty receiver, one of the all-time greats, great hands." • Roy Williams enjoys practice more than the games. • Terrell Suggs is still playing the disrespect card. • The Colts plan to build a run game around Andrew Luck.